The Windows Mobility Centre control panel in Windows Vista offers quick access to several useful controls, including an External Display pane. It can be accessed directly as a control panel in Classic View, or less directly via the heading Mobile PC in Control Panel Home view, which brings up another panel where Windows Mobility Centre is the topmost heading. Clicking this takes you there! 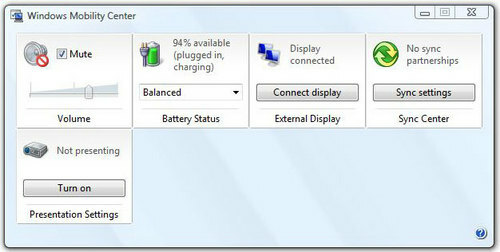 Perhaps the quickest route is by right-clicking the battery/power icon in the notification area, where Windows Mobility Centre is shown as one of the pop-up menu items. The Windows Mobility Centre dialogue (above) has a variable number of panes, according to what hardware happens to be installed on the particular laptop. The panes may be arranged in any order. Here the External Display pane is third from left in the top row. When an external display is connected, click on the Connect display button in the External Display pane to get the dialogue shown below. In this dialog you can choose how to arrange the displays by selecting the appropriate button. 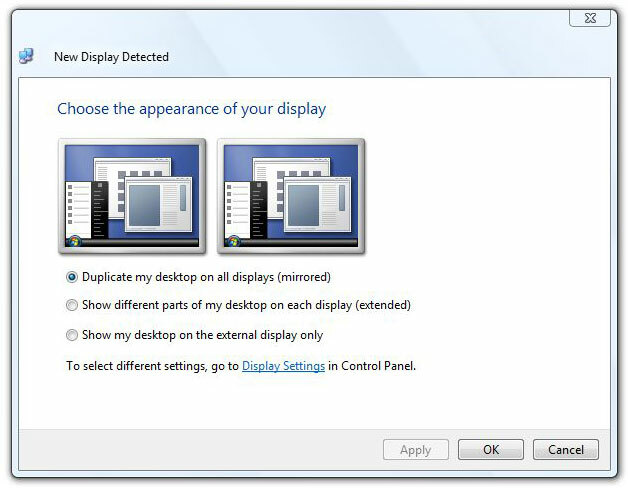 • The first option is classic desktop mirroring, where the external monitor or projector shows what is visible on the laptop monitor. • The second button gives extended desktop with the laptop and the external monitors side-by-side as it were, and which can be exploited in presentation programs like PowerPoint, where the laptop usually shows a Presenter’s view and the external device shows the Audiences’ view. • The third button shows the desktop only on the external device. You can access the actual display control panel to change resolution and other settings via the Display Settings link. Click Apply and then OK when you are done. © Michael Wood, 26 October 2008.